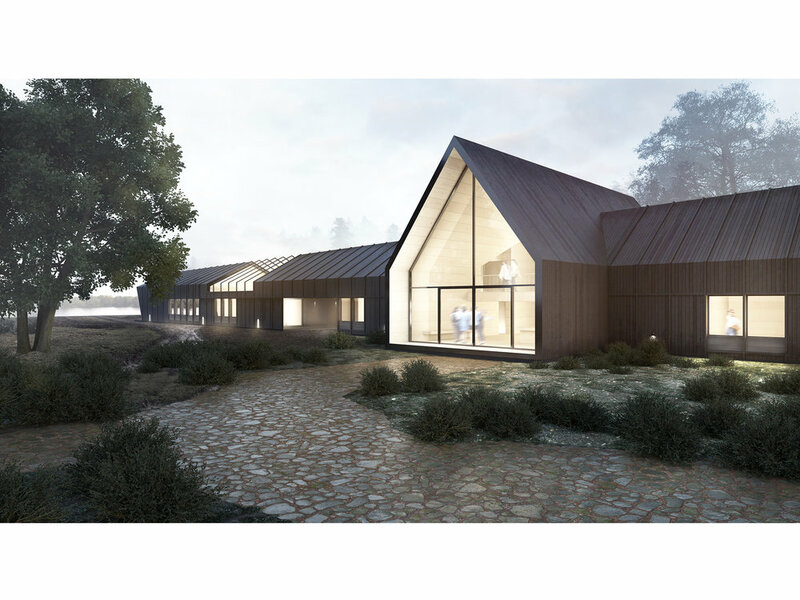 To minimise footprint, cost of construction, security and maintenance, the proposal is limited to two main buildings, adapted to the existing open space and footprint, allowing for the old visitors’ centre to operate during construction. Existing roads, tracks and woodlands are maintained and integrated into the proposal to an extent, and their outlines determine the landscaping. The café, studio and treatment space have separate entrances and can operate independently from the building’s core (reception, shop, exhibition, staff). The wardens’ building forms a more private courtyard that can be secured for parking and storage and is connected to the reserve’s main tracks. The treatment rooms are located separately from the visitors’ centre and with an undisturbed view of the east lake. The idea is that they’ll be delivered at a later stage, funded and operated separately, generating long-term profit and contributing to the maintenance costs of the reserve. The building structure consists of timber frame and hemcrete, an insulating, easy-to-make, bio- material. The whole structure is cladded with strips of locally sourced, long-lasting larch that weathers with time. The main volume of the building faces southeast, with large glass surfaces and solar panels adjusted to the pitched roof ensuring solar energy use, while its narrow shape facilitates ventilation. Rainwater recycling is also proposed. Excavated material reuse, prefabrication and off-site construction for minimal disturbance of wildlife, are suggested, while the combination of simple structural forms facilitates the involvement of local workforce. birdhouse or a bird hide. of two perpendicular “wooden cabins” with the longer roof sloping to accommodate different spaces and frame views. can hold nests with cameras, monitored from inside. A wooden “chimney” is in reality a bat hibernaculum.